Handmade gifts are some of my most favorite to give and get! There’s something about the love and time put into a gift that makes it all the more fun. With 2 weeks left till Christmas, there’s still plenty of time left for a handmade gift (or several!). Plus, handmade gifts are often much easier on the shrinking gift budget. I’ve compiled a list of some super simple DIY gifts that your kids, sisters or friends would LOVE. Time to get cracking! Do you DIE over this mug? Check out Like the Cheese for more great travel mug ideas using vinyl! This awesome post has links to 15 different darling headband tutorials! Let’s hear it for dirty hair days! A gift package in a cute apothecary jar?? Genius!! 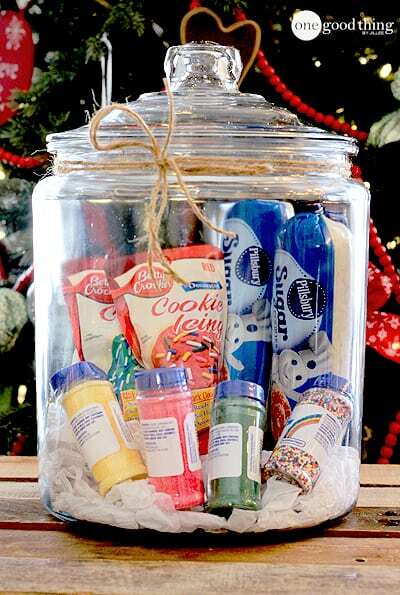 Wal-mart has these for super cheap and who doesn’t love glass jars?? I LOVE CUTE CLUTCHES! I would go crazy if someone made me one of these! You can even make someone on your list a handmade pencil skirt! This video makes it foolproof…plus you only need to know a basic idea of the size, not exact measurements! Can a girl ever have too many lip glosses? I think NOT! Love this tutorial for making your own. I’ve made two of the Rollie Pollie bean bags and my kids use them daily! Get the pattern and instructions here! There’s something about hanging chairs and swings – kids LOVE them! This one looks super easy. I made superhero capes for my older boys probably 7 years ago and they’ve been worn to rags! Now Finn, my 2 year old, plays with them daily. This post has some cute logos! I’ve also made similar crayon/paper holders for all my kids and for many gifts – they’re always big hits, especially for road trips and church! WHY have I not seen this before??? Another perfect road trip or church idea…keep those dang Legos off the floor! Lol. This darling tutorial is full of tips and tricks on how to wrangle tulle and how to make the perfect dress-up tutu! I’ve made one for my girls and they just can’t prance enough! I hope that gives you some ideas for some last minute, affordable gifts. Check out my pinterest page for two separate DIY gift boards…one for kids and adults!